Email lists are the best way to connect with customers. And they’re a great way to boost sales. 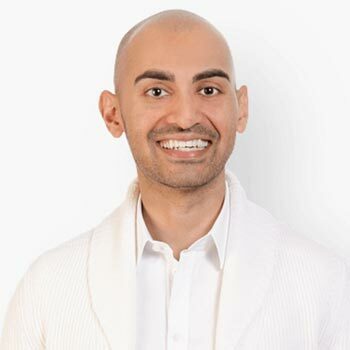 This is a 10 minute guide to setting up your email list, sending your first newsletter and creating a lead magnet that will draw you tons of subscribers. 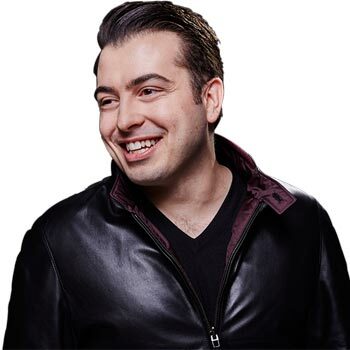 So why exactly does email marketing work so well? You can reach right into your customer’s inbox and connect with them. You step right into their world. With email, your customer has given you permission to come into their life. It builds trust. You’re welcome in their inbox. Customers have already shown interest in your company or product. They’re already halfway there! Email marketing drives traffic. It builds loyalty. And it sells products. 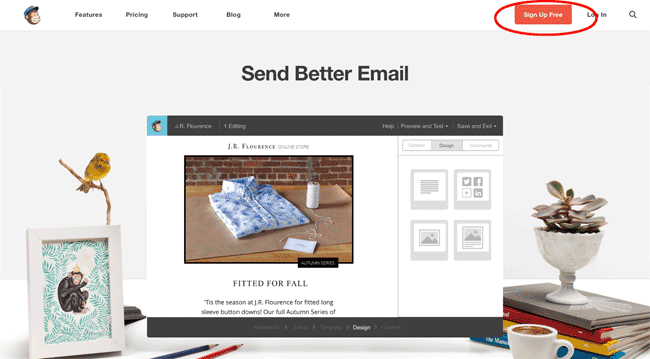 MailChimp is the platform that will help you send thousands of emails at once. You’ll collect email addresses, store them, and analyse the results. Best of all, it takes something that’s a little dull and quite complex, and makes it nice and easy. Let’s dive straight into the process. How to put an email signup box on your website and start collecting addresses. How to design and send your first ever email newsletter. BONUS: How to boost subscribers by creating a ‘lead magnet’. MailChimp is totally free until you hit 2,000 subscribers. So it’s a great way to get started without worrying about the budget. Now, we’re inside MailChimp. You’ve got a few options here. We’re going to assume you’re starting from scratch, so go ahead and click the third option: Start building your audience. Next it will ask you to ‘Create a List’. This is where you’ll store all your lovely email addresses. Below, you can see what one of my lists looks like. This is so important, because it ranks my best subscribers. It shows me who always opens my emails. It shows me who clicks through to my website most. This list tells me exactly which customers are most valuable to me! This is the important part. The signup form is the bit that goes on your website and asks for people’s details. Here’s what my Bitcatcha signup form looks like. You can put this little box all over your website to pick up lots of signups. Want to know the highest-converting locations? We’re quickly going to make one for your website. MailChimp makes it easy, and they give you three different options. 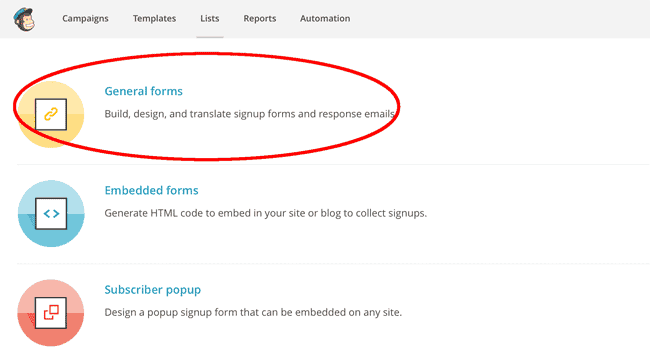 We’re going to choose ‘embedded’ forms which is your signup box. This means you can place it on your website like I showed you before. MailChimp will help you style your signup box or form, and then give you a small piece of code. Keep it handy, because we’re about to put it onto your website. If you’re working with WordPress, the easiest way is to download the MailChimp plugin. It gives you tons of easy options to embed the signup box on your site. If you’re self-hosting the site, simply paste the code into your HTML file where you want it. Every time someone signs up, their email will go straight into your MailChimp list. They’re just waiting to get your first juicy newsletter. Now that you’ve starting building a subscriber list, let’s send your first newsletter! MailChimp offers you four different campaigns. We’re going to choose the regular ol’ campaign. It’s the one you’ll use almost every time. Now for the fun bit; putting your design together! Don’t worry, it’s super easy. In fact, you can choose from tons of pre-set themes and layouts. Or you techies can code your own from scratch. Let’s choose the Boutique theme; perfect for online fashion store owners. MailChimp is easily the best platform for customizing your email newsletters. You simply drag and drop the bits you want. Watch me drag and drop a new image box right into the email. Then just upload the image you want. You can do the same with text boxes, social media buttons and videos. Before you hit the magic send button, make sure you send a test email. Send it to all the different email addresses you have. Try a hotmail address, AOL, yahoo, gmail, and a personal address. Check what it looks like in each browser and (importantly) check it on all the devices you can (smartphones, laptop, tablet). MailChimp are pretty fantastic, and I rarely have a problem with things looking out of place. But you never know. Get someone to read through your content for mistakes. There’s always one. ALWAYS one. This is the terrifying bit. Sending your email to (hopefully) thousands is always a scary moment. Don’t worry, it’s totally fine to hit the preview button six more times. And send yourself another three test emails. Step 6. Breathe a sigh of relief. Then check the stats! The coolest thing about MailChimp is that you get instant stats in real time. As soon as your email shoots off, you’ll start getting feedback. Most of your opens will happen in the first couple of hours. Congratulations! You just sent your first ever newsletter. Now that you’re confident about sending emails, you can work on boosting your subscriber numbers. The magic key to thousands of email addresses is a ‘lead magnet’. This is a tasty little extra you’ll offer in exchange for their email address. It could be an eBook, or a video tutorial. It convinces people to hand over their details. You’ll have seen ‘lead magnets’ like this all over the internet. In fact, you’ve probably signed up for plenty of them yourself! 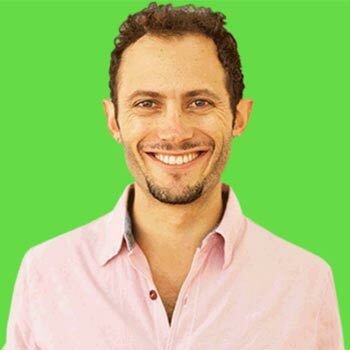 You’ll get double, even triple the number of signups by using one of these lead magnets. The trick is coming up with bonus content that is super useful to your audience, and then giving it to them for free! You can make one of these yourself in no time at all. All we need to do is set up an automatic email that sends your subscribers a link to their free stuff. 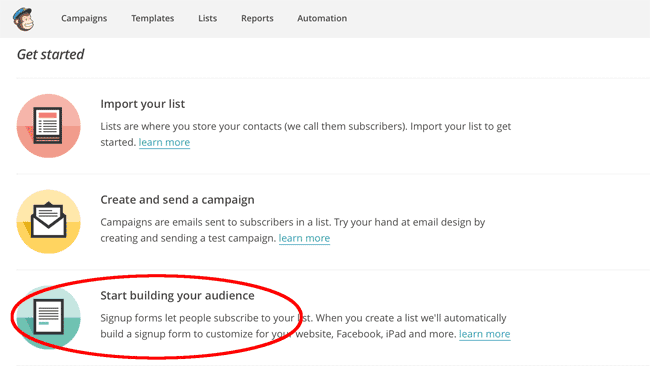 Let’s quickly dive back into MailChimp and head to the ‘create a signup form’ page. This time, choose ‘general form’. We’re going to create that automatic email your subscribers will get after they’ve entered their email address. MailChimp call it the ‘Thank You’ page. On the ‘thank-you’ page, simply include a link to the secret, juicy extra content! Whether it’s a downloadable eBook PDF, or a private YouTube tutorial, that part’s up to you. MailChimp will do the hard work, and send this thank you email to every new subscriber, complete with free content. Easy! It’s simple, effective, and it keeps your subscribers happy. With a good lead magnet, you’ll start collecting tons of email addresses. Sending newsletters is going to change your business entirely. You’ll start to develop a strong loyalty among your subscribers. They’ll get to know you and trust you. They’ll look forward to hearing from you! Hopefully, you’ll soon be managing thousands of email addresses. That means you can send them all your latest offers, exclusive discounts, or general news and content. Email drives traffic back to your site. It creates trust, and it sells products.